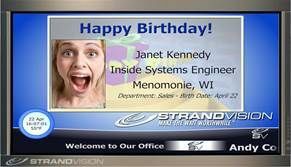 StrandVision Digital Signage now has custom “People” electronic signage pages to make it easy for companies and organizations to automatically call up individuals or groups in order to feature employees’ and members’ birthdays, anniversaries and other events or accomplishments. The free People page can be selected as a page type and entered directly into StrandVision’s Content Management System (CMS) in the cloud or imported from corporate databases. The People storage and display capability is easy to manage. Human Resource administrators or other authorized staff are able to add, modify and remove people from the secure database manually with an entry form for each record or they can automatically fill in the information from another data source such as a corporate payroll system. The form includes employee name, ID, email, location and other identifying information as well as fields for birthday, anniversary and departure dates and a photo. Photos can also be bulk uploaded where the system matches the image file name to employee IDs or names of the appropriate record. The system also includes several configurable free-form fields that can include information on awards and recognition, hobbies, sports, favorite books and movies – any ad hoc information. The automation feature enables administrators to access information directly from Human Resource and other corporate databases. The formatted data can be uploaded directly to the StrandVision People list. StrandVision also offers consulting and programming services for customized connections to automatically retrieve changes from corporate systems. Once in the secure StrandVision database, the information can also be easily added to internal company websites for free as a website plug-in module. Administrators can automatically display selected people by adding a People page type and setting the various selection criteria. Administrators simply select the office location, the driving event – birthday, anniversary, etc., and the selection period – day, week, month, etc. Administrators can use the StrandVision People list to drive multiple People pages – separate birthday and anniversary listings, for instance. The display pages are pre-formatted with animated backgrounds that can feature individual employees or scroll all selected people as a list.